Ever since this spread of designer Richard FitzGerald’s Cape Cod home appeared in Design New England Magazine, I’ve been dying to share the images! As I know and have blogged about the photographer, Michael J. Lee, I asked him right away for permission to share his gorgeous photos of this beautiful home. And now I can finally post them! Mr. FitzGerald is an old school interior designer. Based between Massachusetts and Florida, he’s had the kind of career that doesn’t require lots of marketing and promotions. He was inducted into the first class of the New England Design Hall of Fame in 2007. 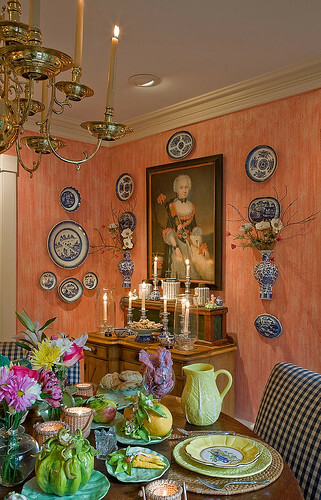 His work has appeared in House & Garden, House Beautiful, The Boston Globe and Cape Cod Life, among other publications. FitzGerald also spent a number of years as the decorating editor at House Beautiful and the east coast/European editor for Architectural Digest. But, for all this, when I posted about the Hall of Fame, I was unable to find any photos of his work online!! So, I was thrilled to finally see inside his personal space – his Cape Cod vacation home. 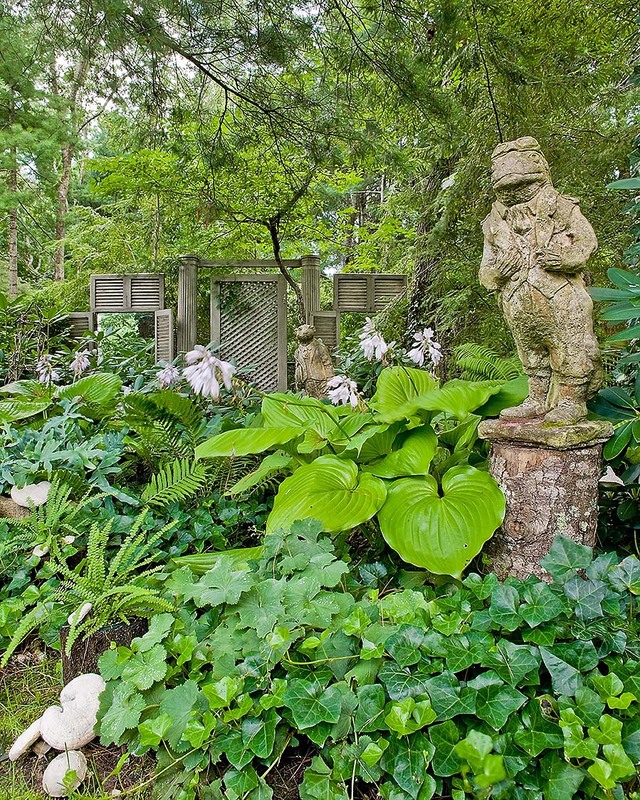 Mr. FitzGerald is an avid collector and gardener and his house and gardens reflect his love of both. 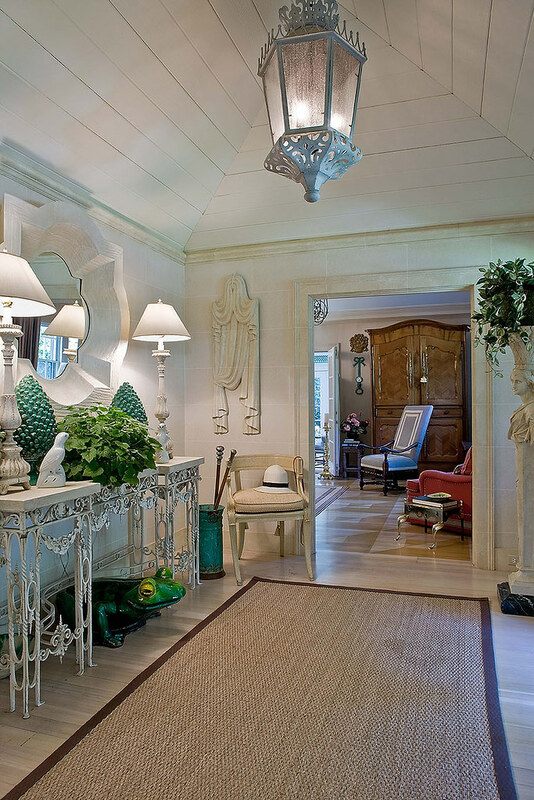 This entry way of the house reminds me very much of Edith Wharton’s entry way at The Mount. It has a decided indoor/outdoor feel which smooths the transition from outdoors to in. The lantern hung from a vaulted, barnboard ceiling feels very porchlike. 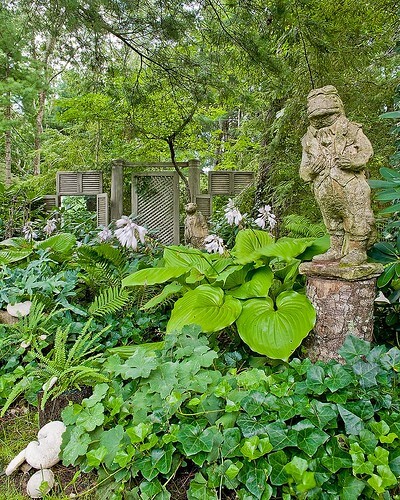 The iron and stoneware, garden frog and plants enhance this feeling. How gorgeous is this combination of peach wall with the blue and white! The walls took their cue from the “ancestor” portrait and the blue and white is carried through the pottery and check on the chairs. 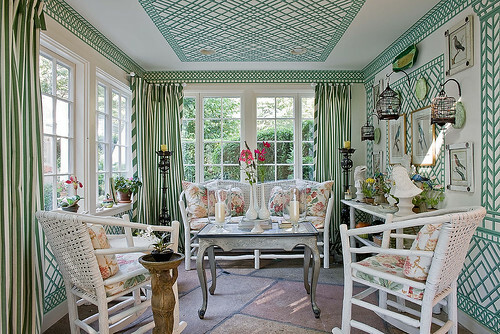 How adorable is this little sun room? One thing I find interesting is that the drapes are stationary – they can’t be pulled across the windows. As an aside, this is a great cost saver where an oppulent look is desired, but when privacy isn’t an issue . The master bedroom opens up to the garden. The master’s master surveys his domain. And the jewel like pool and gardens. Mr. FitzGerald refers to himself as a “Jeffersonian” which is apparent in the classic proportions of the pool house. The glossy white with blue coved ceiling is stunning, isn’t it? And I love the pops of pink on the upholstery and plants. Easy and breezy. Well, a big thanks to Michael J. Lee for sharing his beautiful photos with us. You can view his website here. how deliciously charming!! but, especially that wonderful bedroom just off the garden. perfection indeed. 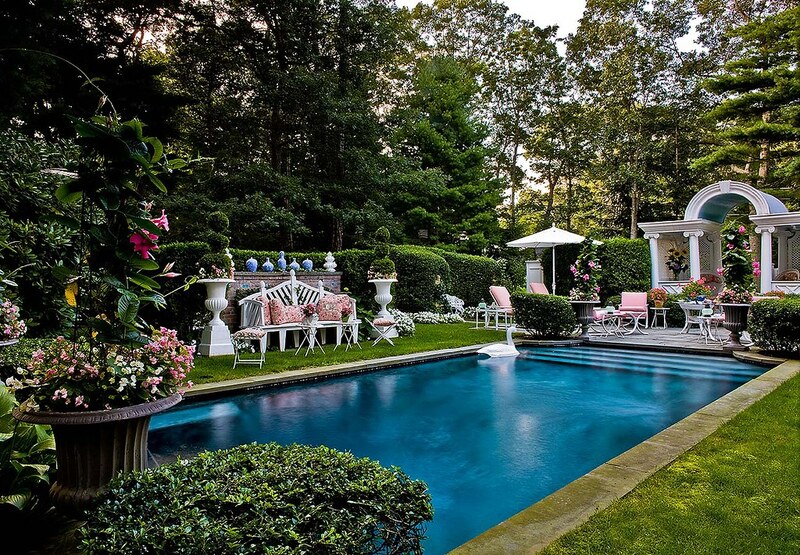 Oh my… that shot of the pool and garden with the folly or poolhouse in the background is so perfect and beautiful… like a dream! And the rest of his home is just so charming! Thanks, Linda! What a beautiful house Linda!!! * Thank you for the DELICIOUS DESSERT to my light dinner of salmon n' salad~~~ it WOULD have all been even MORE PERFECT to enjoy it outside in one of those luscious, pink, upholstered chairs by the pool!!! SIMPLY SCRUMPTIOUS!!! ***** I just finished looking at Mr. Lee's portfolio, and I must say… well, simply stated, it's MAGNIFICENT!!! This is a really beautiful house! The giant ceramic toad is unexpected, brave and quite a hoot! This home is so gorgeous. The garden, the pool, the curb appeal, I'd take the decor in another direction though. I think that you need to be aware that this "blog" is copying several of your posts in their entirety. They have done the same with mine. I did not give anyone permission to do this so I am assuming that you didn't either. I am trying to notify all of the bloggers who have their work appear on this site. I think that it is unethical! I was just going to compliment you on the photography!!!! haha!!! 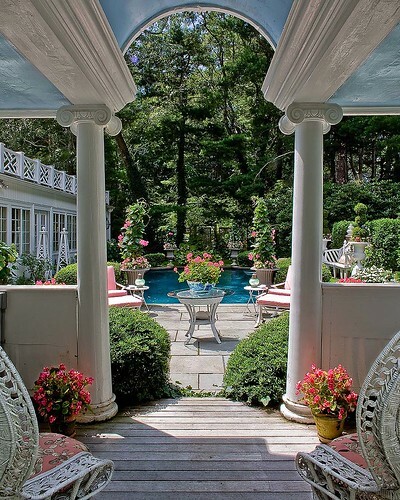 so beautiful – loved the back yard and the dining room = gorgeous!